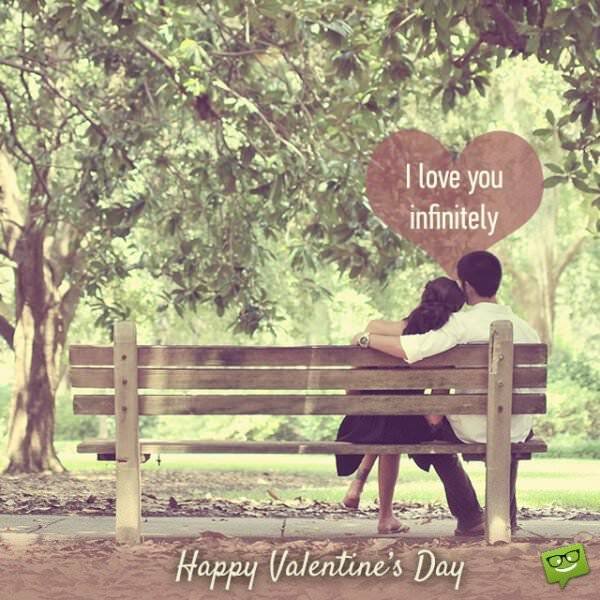 Valentine’s Day, celebrated each year on February 14th, is a special holiday for many people all over the world. 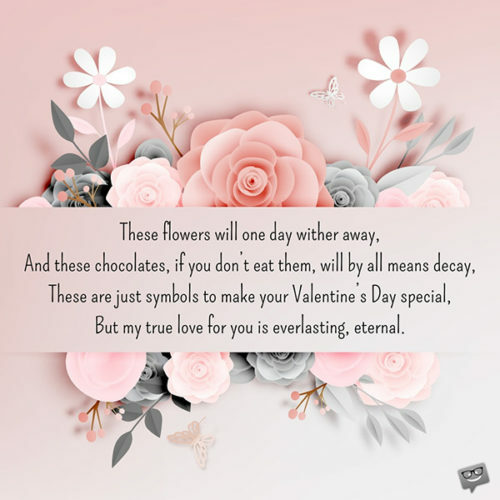 Some celebrate it as a holy day with religious historical significance, while others see it as a day purely associated with love and romance. Either way, it is a worthwhile day to celebrate. For those interested in sharing their feelings of love and admiration with a dear one this Valentine’s Day, the below list is for you. We have taken a variety of viewpoints and compiled them into an easy list of original and useful greetings for your love this year. Take the time to find the perfect fit for you and your admired and share your feelings better than ever before. 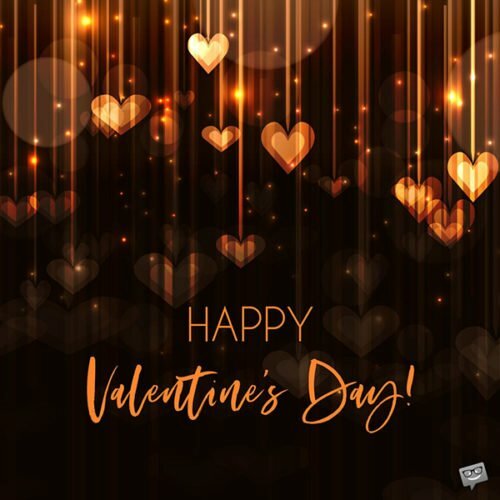 If you’re looking for Valentine’s images specifically for Facebook, you can take a look here, and this is our collection tailor-made for Pinterest, here. On this Valentine’s Day, I can’t help thinking of all you mean to me and how much I love you. You mean everything to me and I am so grateful for your presence in my life. I love you more than words can say. Happy Valentine’s Day to my one true love! 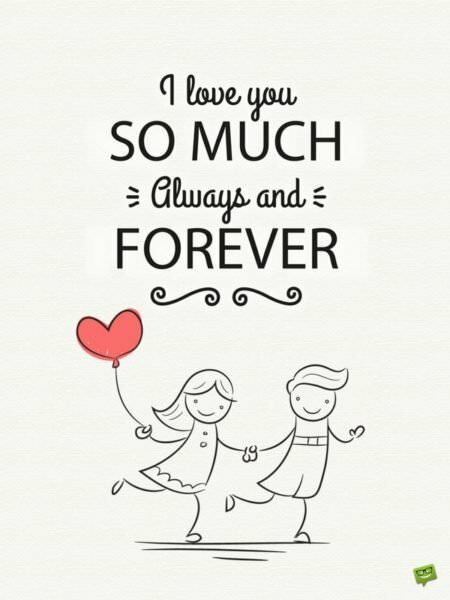 I love you so much always and forever! Looking back on all of the Valentine’s Days we have celebrated together, each one has gotten sweeter and more memorable, just like our love for each other. May we continue in this path and show the world the power of love. Happy Valentine’s Day! To the commercialized world, Valentine’s Day may mean chocolates, stuffed animals, and flowers. To me, though, it means a special day to show and tell you just how I feel about you. You are my rock, my love, and my best friend. May all of your days be blessed and may I also be blessed to share them with you. Happy Valentine’s Day! As a child, I knew I was liked if I got candy and a note in my Valentine’s Day box at school. As an adult now, though, I have a different view. Now I know I am liked if you take the time to hug me and wish me a great day before you leave for work. I must say, the comfort of having you in my life surpasses all of the candy in the world. Happy Valentine’s Day, my dear! 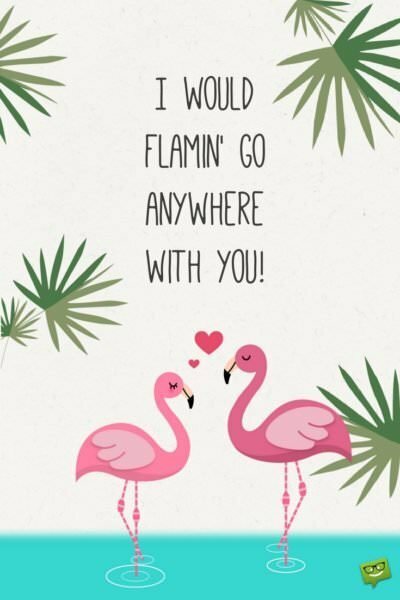 I would flamin’ go anywhere with you! I love you infinitely. Happy Valentine’s Day! There was a time in my life, as I know is true for many others, that I wished Valentine’s Day would come and go without much fuss. I had no one to share it with and did not want to be reminded of my solitude. Once you came along, though, my thought of this holiday changed entirely. Now I see its beauty and the fascination of its cause. Now I realize how much better the world is because of Valentine’s Day. You have brightened my world and lightened my soul. You are the one I love today and forever more. Happy Valentine’s Day, sweet one! Some people wait all year long to express their love solely on Valentine’s Day. It’s almost as if they don’t know how to do it any other day. With you though, I see, feel, and hear these expressions of love each and every day. You are the best lover I can imagine. Happy Valentine’s Day, my love! Valentine’s Day is so special to me. It is a day dedicated to the one I love more than anyone else in this world. It is the day I can put all of my responsibilities and stresses aside and simply focus on the magic that is the union of us. On this day, I renew my vows to you and reignite my passion for you and our life together. It is this day I cherish most. Won’t you join me in this special day? Happy Valentine’s Day to the one I love more than any other! Every day with you is amazing. You make me laugh, smile, and be a better person. Without you, I would not be as compassionate and caring, loving, or kind. You have blessed my life in so many ways and I am forever grateful for the blessing that is you in my life. Happy Valentine’s Day to the one who inspires and motivates me each and every day! I love you, sweetie! Soft and gentle, warm and kind. Simple words to describe one amazing man. Before I met you, the world seemed cold and cruel. I could not see the magic and light, no matter how many corners I turned. However, once I saw you everything changed. The world came into focus and my burdened seemed light. You are the one for me and I feel blessed to call you my wife. Happy Valentine’s Day, sweet one! May you be blessed today and always forevermore! Tears of joy stream down my face thinking how lucky I am to have you in my life. I certainly did nothing to deserve you and will appreciate you always. You are beautiful, courageous, and magnificent, all rolled into one. I pray you will bless me even a little bit with those same attributes. Happy Valentine’s Day to the most amazing person I know! 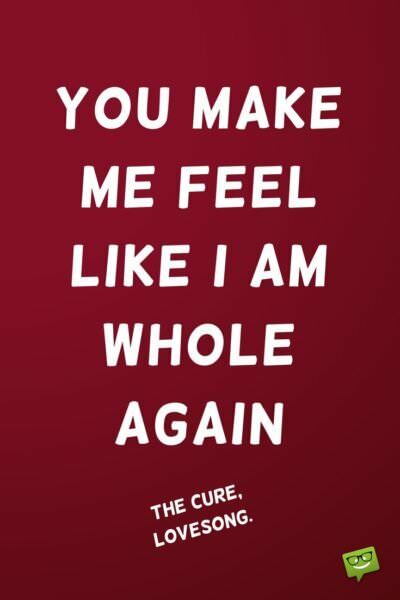 You make me feel like I am whole again. The Cure, Lovesong. 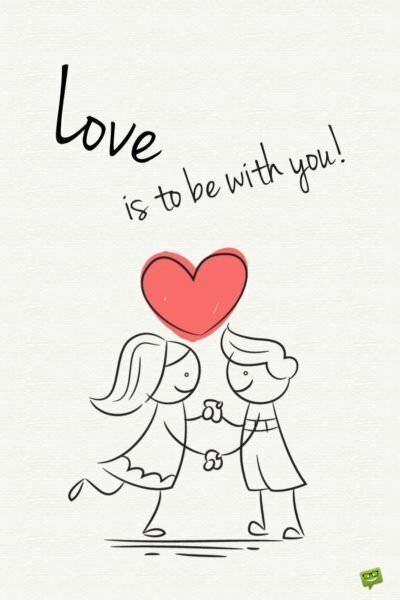 Love is to be with you! Here it is again, another joyous Valentine’s Day. Here to greet us with love and caring, peace and joy, comfort and imagination. May today as all others be a day we can truly share with one another the depth of how we feel. Happy Valentine’s Day to my irreplaceable wife! I love you! My heart beats even stronger for you on Valentine’s Day. On this day, I am reminded of how you hold my heart and I swoon just thinking of you. You are, will be, and always have been my one true love. Here’s to a full lifetime of love and laughter between us two crazy birds. Happy Valentine’s Day! As you can tell, a lot of thought went into each of these greetings just for your consideration. By using one of these gems, your loved one will know you think highly of them, as well. Here’s to the happiest of Valentine’s Days to you both and many more to come!